Well, the Senate and House when Nancy Pelosi were stupid enough to believe Gruber's deceptions. 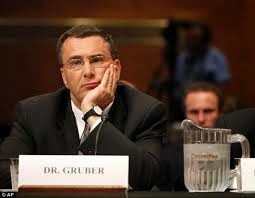 Over the past two weeks Obamacare architect Jonathan Gruber has been seen on video repeatedly insulting the intelligence of the American voter and admitting the healthcare overhaul was written to deceive the public about costs, taxes and a redistribution of wealth of healthy to sick. Today, Chairman of the House Oversight Committee Darrell Issa officially invited Gruber to testify on Capitol Hill. "The Committee on Oversight and Government reform requests your testimony at a hearing on Tuesday, December 9, 2014, at 9:30 a.m. in room 2154 Rayburn House Office Building in Washington D.C.," Issa wrote in a letter to Gruber Friday, adding that he should be prepared to make a five minute opening statement before answering questions. Gruber received nearly $6 million in taxpayer money at local and federal governments for work as a contractor on the healthcare law.